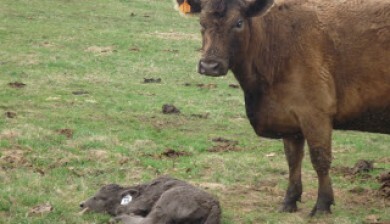 There is no happier day on the farm—if you’re a grassfed steer, that is—than that day in spring when the farmers finally deem the grazing fields open for business. Today was that day. Calf #2 was born this morning. It’s a girl!! She’s been adorned with a very stylish #39 earring and officially welcomed to the clan. Tally so far? Boys 1, Girls 1.